The designer’s signature romanticism and feminine embellishments were on full display with an outing of botanical prints and lace frills adorning everything from gowns to tops. The color palette also reflects an outdoorsy sentiment with a mix of eglantine rose, bougainvillea and verdant green. Not everything is light and ethereal though; the Saab woman gets glam in sparkling gemstone decorated gowns for evening-wear. 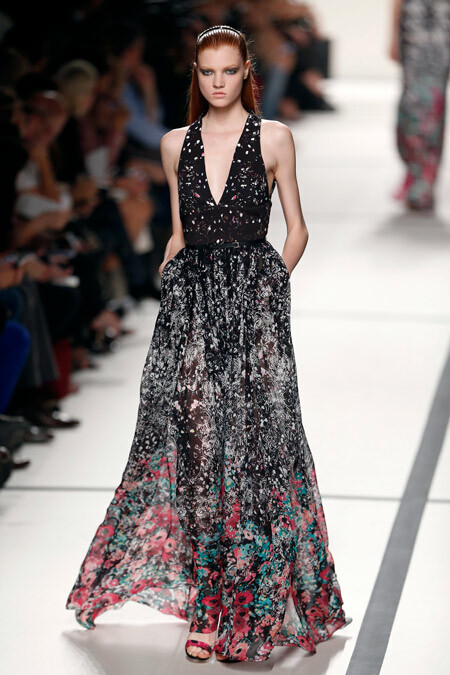 There was also a black and white chiaroscuro lace dotted with more flowers that decorated gowns from bust to hem. The chiaroscuro came out ahead. Even if the color black doesn't have much place in a rose garden, the black lace dresses at the end of Saab's collection stole the show.